Simian Line: Big Five personality profiling! + simian line & Big Five profiles of 3 Oscar-winning actors: Anthony Hopkins, Jodie Foster & Robert De Niro. An in dept study focused on 15 simian line people (without transitional variants) shows that the average approaches the Melancholic profile (Depressive profile is a close runner-up); 33,33% (5 out of 15) approach a profile featured with a melancholic temperament, and 60% (9 out of 15) have a profile combination featured with a melancholic temperament. NOTICE: Included in the present study are only 15 individuals (= 5,7% from a sample of 262 subjects) who's hands meet the criteria in one or both hands for a 'single crease' or a 'transitional single crease variant' (see picture above). This implicates that 6 other individuals who have been assessed to have a 'normal 4/simian 4' variation of the so-called 'transitional variants' have been excluded from this study (in order to avoid that arbitrary factors become involved whether such 'transitional variants' should be counted to represent a simian variant or a normal variant - especially, since in those variants the 'normal 1' structure is not missing!!!). What are the implications of the simian line in the perspective of psychology? According medical science the single palmar crease can safely be regarded to represent a 'harmless minor physical anomaly' bearing merely statistical impact towards a wide range of medical issues, diseases and syndromes. The current in dept study shows a likewise statistical impact in the perspective of personality profiling, with results produced by individuals [N=15] which cover a large area of the full spectrum of possibilities in terms the so-called Big Five meta-components Alpha & Beta. However, a deeper analysis of the results does reveal a tendency towards low scores for Cognitive Efficacy, and a very consistent tendency towards a low score on at least one of the meta-components - only 1 out of 15 simian line individuals does not show this tendency, which illustrates that simian lines are by principle occasionally also found in personalities featured with both Cognitive Stability (Alpha) and Cognitive Flexibility (Beta). 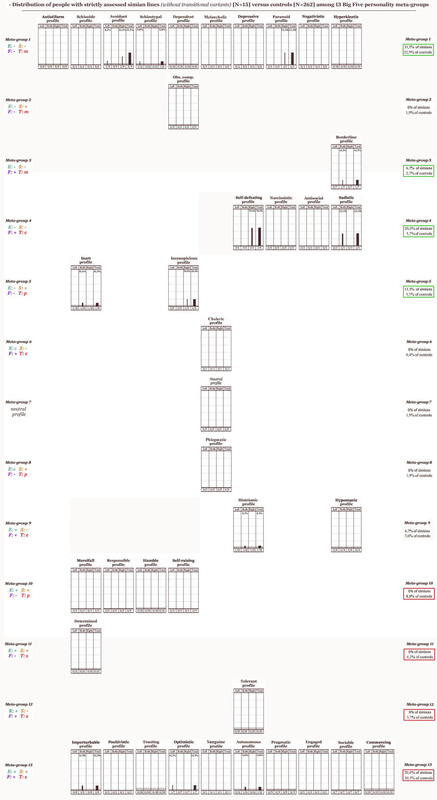 The average Big Five profile of the studied simian line subjects approaches most closely the Melancholic profile (out of 39 personality profiles), but also not far away from the Depressive profile - see meta-component chart presented at the top of this article. 9 out of 15 simian liners (60%) have a profile-combination (involving the no.1 and no.2 profiles with the smallest distance in every individual) featured with a melancholic temperament. 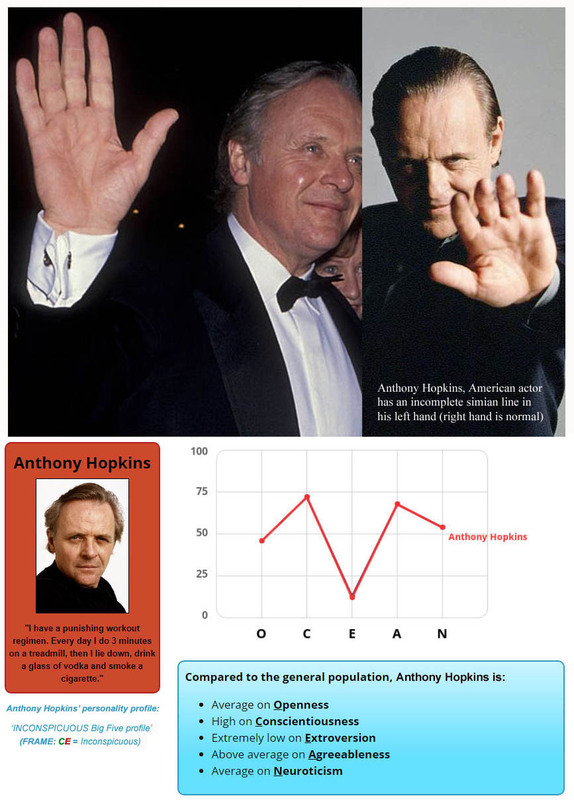 Data involving Big Five profiles of 3 Academy Award [Oscar] winning actors (Anthony Hopkins, Jodie Foster & Robert de Niro - who all three have a simian line in one hand only) is presented in addition only for supplemental purpose. The results of the present study, standing in the perspective of normal behavior, is recognized to show a parallel with earlier reported results in the perspective of abnormal behavior. Because a relatively high simian line prevalence has been reported in studies focused on quite a few major psychiatric issues (such as: schizophrenia, psychotic behavior, developmental disorders & occasionally other forms of psychopathology such as Alzheimer disease). A small effect-size is also spotted for the variations in which hand(s) the (in)complete simian line is found. Subjects with a simian line in both hands appear inclined to have scores towards below average Cognitive Stability (= low Alpha); subjects with a simian line in the left hand appear inclined to have scores towards below average Cognitive Flexibility (= low Beta). And subjects with a simian line in the right hand only appear inclined to have scores towards the combination of below average Cognitive Stability and below average Cognitive Flexibility (= low Alpha & Beta). A summary in terms of the distance from other profiles is presented below for each variation - with 'distance' representing the average square distance derived from the sum of 7 components: the individual Big Five dimensions + Alpha + Beta (using the summarized values for Alpha & Beta). Choleric profile (0,39), Narcissistic profile (0,66), Neutral profile (0,66), Sanguine profile (0,79), Histrionic profile (0,93). Depressive profile (0,18), Dependend profile (0,29), Schizotypal profile (0,41), Avoidant profile (0,49), Melancholic profile (0,50). Phlegmatic profile (0,49), Schizoid profile (0,68), Melancholic profile (0,61), Depressive profile (0,96), Neutral profile (1,09). 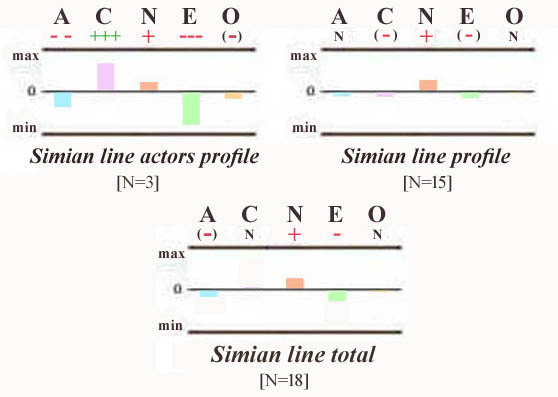 Remarkable phenomena in the distribution of simian lines cases among the Big Five profiles! • In the full research population [N=262] almost 1/3 of the subjects (30,5%) approach most closely a profile in meta-group 13; however, in the simian line sub-group only 3 out of the 15 cases (20,0%) approaches a profile in meta-group 13. The highest prevalence for the simian line sub-group is found in Meta-group 1, where 5 out 15 cases are found: 33,3%, versus only 22,9% for the full research population. • It's remarkable that 8 out of 15 simian cases (53,3%) approach a profile in meta-group 1 or meta-group 4, while in the full research population only 28,6% approaches a profile in these two meta-groups. Also, 6 out 15 simian cases (40,0%) approach a profile featured with a melancholic temperament combined with a negative score for Cognitive Efficacy - versus 26,5% for the research full population. • For individual profiles is the highest prevalence found in the 'Self-defeating profile': 50%, though this result is based on only 2 simian line cases (both have a simian line in the right hand only) - versus 4 cases for the full research population. Remarkably high scores are also found for the 'Avoidant profile' (33,3% based on 3 simian cases - two individuals have it in the right hand only, 1 individual in the left hand only), 'Sadistic profile' (33,3% based on 1 simian case - who has a simian line in both hands) & 'Paranoid profile' (33,3% based on 1 simian case - who has a simian line the right hand only). However, in terms of the personality these 7 simian line cases only show a similarity involving a low Alpha meta-component and a low Alpha + Beta score (6 out of 7 cases have a low score on Neuroticism). • Another remarkable results involves the fact that all 5 subjects with a simian line in the right hand only are found in the upper side of the scheme; in 5 out 18 profiles of meta-group 1 to 5 the simian line group has a prevalence of 20% or higher (versus none in meta-group 6 to 13). 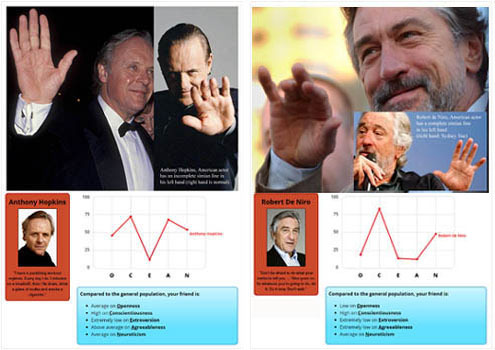 The illustrations below present for three Oscar-winning actors with a simian line their Big Five personality profiles (according idrlabs.com) - featured with an impression of their simian line: all three top-actors have the simian crease in only one of their hands. All three also belong to the small group of 75 leading-role Oscar winners who also have won at least 4 leading-role Oscar nominations... but many of those 75 are not featured in one of the IMDB all-time Top 25 movies, but the simian-trio is featured there as well!!! 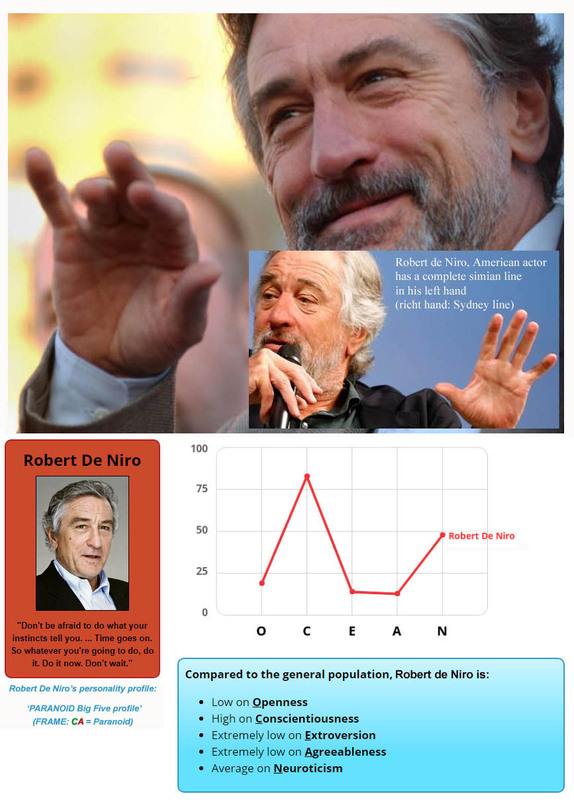 NOTICE: The Big Five profiles of Anthony Hopkins, Jodie Foster & Robert De Niro are presented by idrlabs.com (being part of a sample 52 actors) are based on the public appearance of the persons - this implicates that it remains unclear whether the profiles are completely representative for their personalities. The profiles of the 3 Oscar-winning actors score all three low for the Beta metacomponents; all three also score (very) low for the Big Five dimension Extraversion. 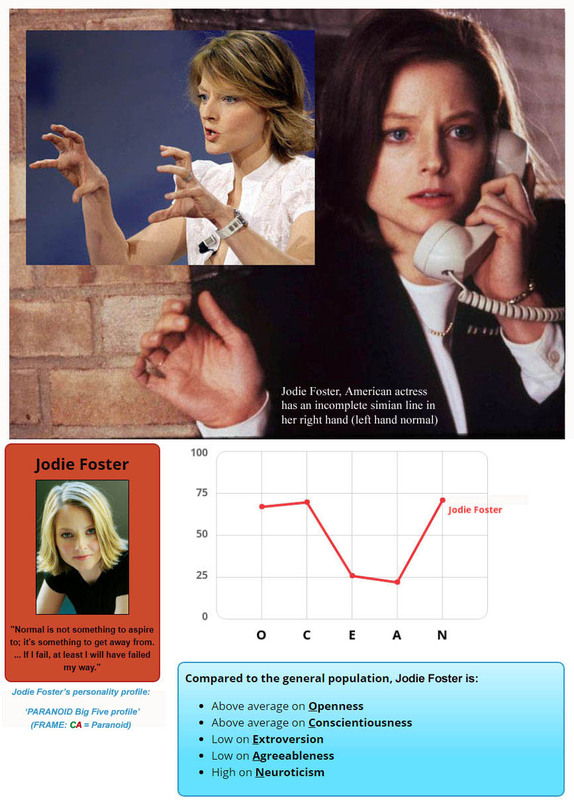 Anthony Hopkins' profile approaches mostly the 'Merciful (+ Inconspicious) profile', Jodie Foster's profile approaches mostly the 'Paranoid (+ Schizotypal) profile', and Robert De Niro's profile is found between the 'Obsessive-compulsive & Inert profile'. The average Big Five personality profile of the 3 Oscar-winners is displayed in the picture below, featured with an impression of the impact relative to the findings involving the average results for the simian line sub-group with 15 simian liners included. A similarity regarding the direction of the results of the 3 actors can be spotted for four of the Big Five dimensions; the results is only clearly different for the Big Five dimension Conscientiousness. NOTICE: These 3 Oscar winners also belong to a very small group of 5 top-actors that have received the "Cecil B. DeMille Award" - the Golden Globe oeuvre award for "outstanding contributions to the world of entertainment" - during the time-span of 2006-2013 (Anthony Hopkins in 2006, Robert De Niro in 2011, and Jodie Foster in 2013). More details: 80+ Famous simian lines, including 5 Academy Award nominees! The impact of the simian line in the perspective of psychology appears to show a parallel with results reported in the perspective of medical science & psychiatry. Nevertheless, even though the simian line may bare value for groups of simian liners, the effect-size for groups is typically a matter of statistics - which implies that any of the reported tendencies for the full Big Five personality profile clearly does not apply to the full group of simian liners. 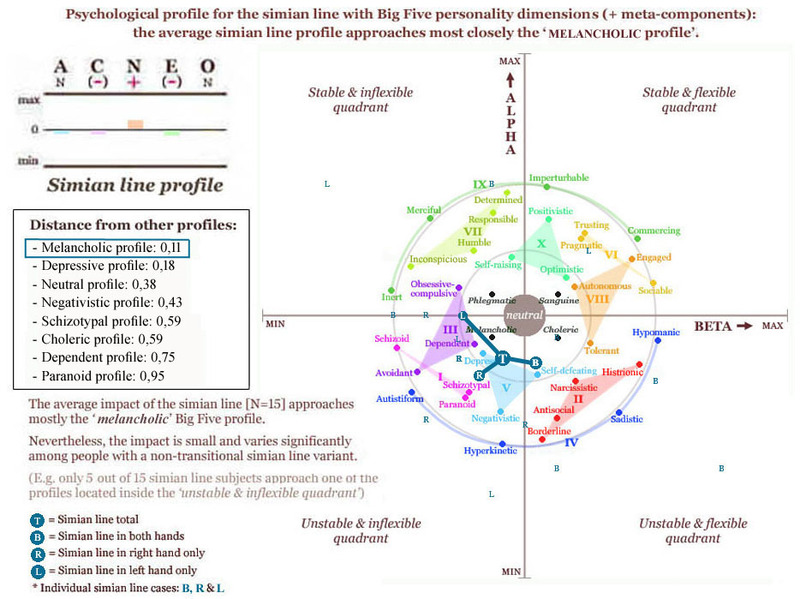 Also, the average Big Five profile shown in the picture at the top of this article suggests that the impact of the simian line is most likely most high for aspects of behavior involved with high scores for the Big Five dimension Neuroticism (= low scores for Emotional Stability, the counterbalance factor involved with Neuroticism). FINAL NOTIFICATION: Even though the palmistry literature has a folkloric tradition in supporting the belief that simian line bare specific value in the perspective of personality or behavior (though there is no consensus on this in the global palmistry community and many palmistry authors appear to cherish private perceptions on this matter), the results of this study do not support such beliefs because the variation of behavior among simian line people is very likely much larger than what is suggested by far most palmistry books (this also applies to literature with references to palm reading, hand reading, hand analysis, chirology, chirognomy, chiromancy, chirosophy, etc.). System for Big Five personality profile interpretation! Hand sign constellations in the Big Five personality dimensions! • Psychodynamic profiling: the simian line!